Dealer Tamara Darvish is co-author of a book about efforts to help terminated dealers get back their stores. When Chrysler and General Motors filed for bankruptcy in 2009 and terminated nearly 2,800 dealerships, it caused a dilemma for the National Automobile Dealers Association. NADA, traditionally the loudest voice on behalf of dealers in Washington, was torn between the interests of its dealer members who had been stripped of their businesses and its members still in business, many of whom benefitted from having competitors eliminated. Then along came Tamara Darvish of Darcars Automotive Group in Silver Spring, Md. ; Alan Spitzer of Spitzer Auto Group in Elyria, Ohio; and Jack Fitzgerald of Fitzgerald Auto Malls in Kensington, Md. The three dealers organized and became leaders of the Committee to Restore Dealer Rights. Their goal: Help terminated dealers get back their dealerships. Wall Street investment banker Steven Rattner, the first car czar overseeing the government-run reorganizations of GM and Chrysler, quickly caught the attention of disenfranchised dealers. In 2009 Rattner became the focus of their frustration with a bankruptcy and reorganization process that took away their businesses and gave them no say in the matter. 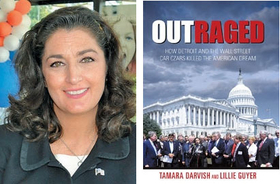 In their recently published book, Outraged: How Detroit and the Wall Street Car Czars Killed the American Dream, Tamara Darvish and reporter Lillie Guyer say Rattner badly misjudged the economic significance of new-car dealerships and the political clout wielded by dealers. Here's an excerpt. One other misstep: the task force seemed intent on bypassing Congress as part of making their restructuring decisions. That move -- ignoring the traditional route of shaking up the country -- would prove to their disadvantage in the coming months. In an initial testy meeting with U.S. Representative Steny Hoyer, Steve Rattner was growing irritated with the clamor arising over dealer closures. Hoyer, who ran the House of Representatives after Speaker of the House Nancy Pelosi, further pressed the case of dealers. Hoyer brought up the issue of two Maryland dealers he knew, Tammy Darvish of DARCARS Automotive and Jack Fitzgerald of Fitzgerald Auto Malls, as among the closing stores. They ran dealerships in three states each, and they happened to be his constituents in Maryland. But it was about more than two dealer groups, even such large ones, to Hoyer. Rattner claimed to be confused as to why so much noise erupted over a few car dealers -- referring to Darvish and Fitzgerald. "I was mystified that the House majority leader chose to devote so much time to this," Rattner wrote in his book Overhaul, published in September 2010. "The nation was plagued by economic and financial crises; why would the second most important member of the House after Speaker Pelosi think that two car dealerships merited his personal attention?" The lesson Rattner perhaps failed to grasp is that Darvish and Fitzgerald were appealing to Congress on behalf of several thousand disenfranchised dealers and several hundred thousand U.S. jobs. In fact, the two CRDR leaders rarely brought up their own cases of cut dealerships when speaking in public or when meeting with congressional representatives. All along, Rattner continued to be mystified on the dealer-closings issue and why his office was suddenly flooded with hundreds of calls, e-mails, and letters about the closings they had to handle. He sensed the politicians' growing anger over the dealer issue and he and his colleagues tried to allay their concerns, he said. "What hundreds of calls did the task force, or Rattner, respond to?" Tammy Darvish asked incredulously in a dealer memo. "The task force didn't talk to dealers. They didn't decide which dealers would go, but they surely mandated that dealers be reduced based on their willful ignorance, lack of experience, and bad information they got on how retail dealer networks work." At the same time, the voice missing from the table before the task force did its surgical work of snipping was that of dealers. The government was there, the automakers, the UAW, the bondholders, and the credit companies. But not the dealers or their recognized representatives. All along, Rattner dismissed the cuts of thousands of dealers, not seeing what the furor signified. To a financier, though, five thousand, two thousand, one thousand, or fifty are just numbers on a spread sheet. He or she doesn't see the human beings these numbers represent. The bigger the numbers, the more the savings, from a bean-counter perspective. Another message lost on the task force: Nearly 170,000 direct jobs in dealerships and directly related businesses would vanish if car dealers closed, and even more if their employees and the trickle-down effect on businesses in their communities were counted, the CRDR group argued. The projected job losses were based on numbers from NADA, which operates a well-regarded research group. If dealers disappeared, it could shatter entire communities. The campaign to save dealers was also about consumers and private citizens who watched mainstay businesses being shuttered and wondered where they would buy their cars or go to get them fixed; or where they might find another good-paying job. The communities in which dealers did business depended on them for everything, from jobs and a solid tax base to charity and goodwill support. Flipping burgers in fast-food restaurants or selling sundries was not a viable means of support for most people. Rattner and crew didn't seem to factor in the clout of dealers in the task force's decisions, or maybe they didn't know it, dealers thought. But Hoyer knew. He would not go away. He called a July 8 summit with a select House committee, the two automakers, and the task force in his cramped offices on Capitol Hill. Dealer reps were not present at that meeting; NADA was apparently invited, according to Rattner, but didn't attend. NADA was the largest dealer trade group, based in the DC area, with about eighteen thousand members. David Weaver, the senior staff advisor to Maryland Democrat Chris Van Hollen, who attended the July meeting, said the road was strewn with misunderstanding on the part of the task force on the dealer situation. After the July summit, he said, things still did not clear up as Rattner and the task force dug in their heels. They didn't understand that Congress was not anti-automakers. Their fight was pro-dealers and small business. "At no point did Congress ever say they disagreed with the decision to bail out Chrysler and GM," Weaver said. "What they didn't get, or what it comes down to, they were acting like finance guys -- forgetting everything else because a collapse of the automakers would cause a significant ripple effect on the American economy. They clearly bought into the argument manufacturers were making that they were overdealered, and dealers were part of the problem and not the solution. The only ones more arrogant than [the task force] were GM and Chrysler." Excerpted from Outraged: How Detroit and the Wall Street Car Czars Killed the American Dream by Tamara Darvish and Lillie Guyer. Copyright 2011 by iUniverse.com.